The solid and robust Riviera Flybridge collection is the evolution of a rich 35-year heritage in building worldclass luxury motor yachts that are pedigree-proven in some of the most challenging seas and oceans in the world. In fact, Riviera Flybridge motor yachts have even safely and comfortably circumnavigated entire continents. Vital to the growing global affection for our true blue-water classic Flybridge design is the realisation that man does not live by fishing alone – a boat must be able these days to also be the consummate entertaining vessel, the ultimate passage-maker, the total family getaway, even the perfect home away from home where owners can enjoy extended living aboard without pining for any shore-side comforts. The Riviera Flybridge collection combines superior sea-keeping capabilities and clever alfresco lifestyle designs, ultramodern technology and luxurious appointments – reflecting Riviera’s position amongst the best luxury motor yachts in the world. This in no small measure is due to Riviera’s passion for excellence in everything we do as we strive to help owners achieve ‘the ultimate boating experience’. You will sense our hallmark passion for excellence from the moment you step onboard – double transom doors allow access from both the port and starboard sides, in effect adding the large swim platform to what is already a full-scale, no-nonsense cockpit and creating a walk-around transom lounge with additional storage compartment for swimming and diving gear, or optional live bait tank with glass front if you prefer. The swim platform, with lift-out strong stainless steel rails, also has a number of options to suit individual owner requirements, for example: custom rod holders and a bait preparation station can be fitted for the angler, as well as a 400kg (882lb) hydraulic lift to assist with tender storage. In the floor of the 9.90 square metre (106’6”) cockpit are separate hatches – with marine-grade stainless steel lock-downs – providing direct engineering access, as well as a large, central, self-draining moulded lazarette locker to store furniture and water toys, and deep fish bins to port and starboard. Forward there is a comfortable three-seater cockpit mezzanine lounge to port – upholstered in high-quality weather-proof material – and there is an optional integrated and interchangeable table to provide a versatile alfresco entertaining area, and which can also be converted to a day-bed. Behind the cockpit lounge is a double-plated refrigerated cool box and self-draining recycling bin, as well as manual bilge pump access and lockable cabinet containing battery switches and AC/DC control board. 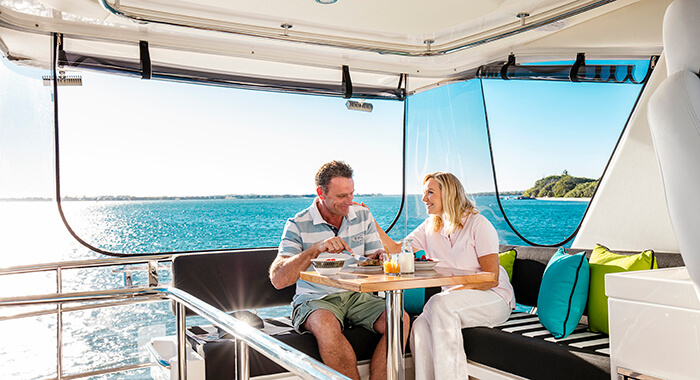 To starboard there’s lift-up lid with gas strut which reveals a double BBQ with stainless steel splashback and LED lighting, ice-maker, sink, solid surface benchtop and even more storage – enough to impress even the most discerning chef. The cockpit’s joystick docking control is also to starboard, although owners have the option of having it located on the port-side if desired. This control is protected from the elements in its own enclosed, moulded compartment. Extending out and over the cockpit is the GRP hardtop, which can be extended with a stainless steel and acrylic canvas awning for further protection from the sun and extremities. The rear saloon bulkhead of the 52 Enclosed Flybridge is tinted, tempered glass set in a highly polished, marine-grade stainless steel frame that adds to the sense of light and space as you step into her spacious and luxurious saloon. To port is the modern and functional U-shaped galley from which a huge glass awning window opens out and over to the cockpit, in effect opening up the rear of the boat for a free-flowing feel all the way from the windscreen to the swim platform and, at the same time, affirming the galley as the central entertaining hub of the 52. The gourmet galley has a contemporary two-pack finish to the overhead cupboards, complementing the satin-finish American oak timber cabinetry with options of high-gloss or satin cherry, satin teak or satin beach. Standard galley features include a premium two-burner electric cook-top with in-built pop-up fiddles to secure pots, a convection microwave oven and an optional drawer dishwasher within handy reach of the stainless steel sink. The solid surface bench top includes sink-cover that doubles as a cutting board, while the mixer tap conveniently swivels so you can easily wash out the self-draining rubbish bin compartment to port. In the headlining above the galley is a rod locker, and to starboard are two drawer fridges and a freezer, as well as a drinks cabinet (of course, with easy access from the cockpit) which has built-in glass and bottle storage. The 52 Enclosed’s spacious saloon features a large C-shaped lounge to port with a hi-lo dining table which folds and lowers to become a coffee table. Adjacent to the dining area is an optional three-seater settee in which the middle seat base can slide out as an ottoman and form additional seating around the main dining table – also handy for family games nights. An additional table also lifts out from the settee and sits between the two remaining seats, forming additional dining or work space. Forward of the three-seater settee is a 40-inch television and high-end sound system, stored out of the way in its own dedicated compartment to starboard. It rises elegantly and electrically at the touch of a button, and swings for viewing from every saloon seating position. Opening, tinted and tempered side windows and huge windscreen looking out over the foredeck and bow draw in more fresh air and natural light. 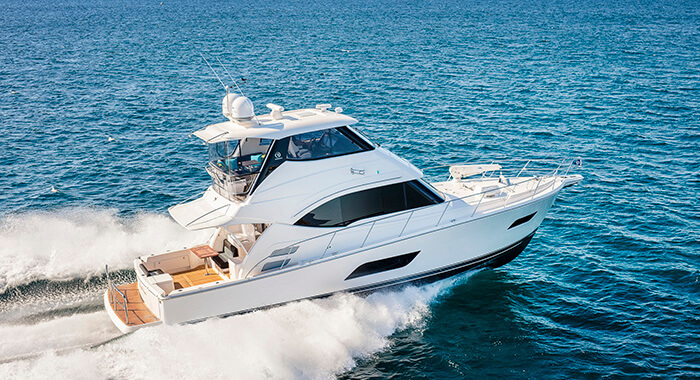 Riviera’s steadfast commitment to going “first-class” in everything it does extends to the flexible threestateroom/ two-bathroom accommodation deck of the 52 – again there’s absolutely no compromise in terms of quality or on-board liveability and luxury. Natural light filters into the wide accommodation atrium courtesy of the massive saloon front and side windows above, and is complemented by the accommodation deck’s own clever design elements. You’ll immediately garner a sense of spaciousness as you step down the non-slip, natural timber-finish companionway – the extent of headroom is clearly evident below deck. Ascending to the modern flybridge via a stylish floating internal staircase with teak treads on the starboard side of the saloon entry, you start to gain a full appreciation of the thought and consideration behind this new-generation Riviera. 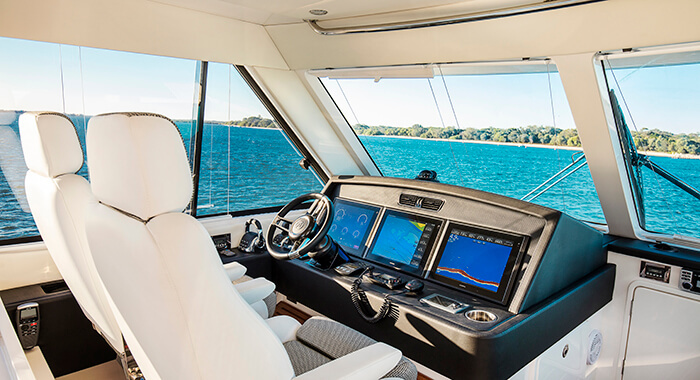 Enclosed on three sides, the ultra-modern flybridge is both spacious and sumptuous, with the rear enclosed by strata glass from the hardtop to the floor with marine-grade U-shaped opening zippers, and complemented by a highly polished rear, marine-grade stainless steel railing. Guests and crew will relish relaxing in this virtual sky lounge courtesy of the large L-shaped lounge to port, which also has a lift-up base for even more storage, soaking up the bright and breezy atmosphere achieved through the large, opening side windows and massive windscreen – all of which have covers. Thoughtfully placed overhead grab rail and a padded, upholstered headlining are a nice touch too, as is the wet bar including solid surface bench top, refrigerator, drink holders, sink with hot and cold water … all serving to keep you refreshed while underway, and nice and close to the staircase so the galley can easily feed prepared delicacies up to the gathering – simply send your request via intercom. 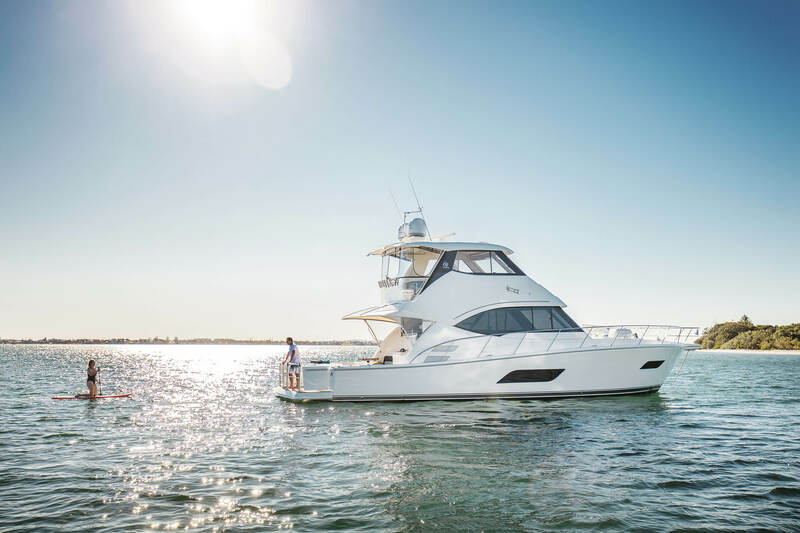 There’s a lockable hatch and stainless steel ladder to the hardtop – and there’s even an option for an electric sliding sunroof and integrated blind to open up the flybridge even further, should you desire. And if you desire your own personal soundtrack to the panoramic view, the Riviera 52’s flybridge also sports an AM/FM stereo, CD/DVD player with iPod interface and four speakers, with the option of including an integrated 26” LED TV.